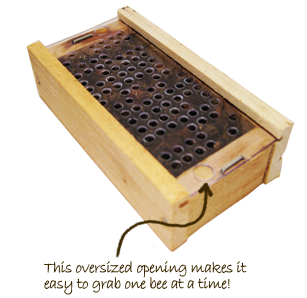 Our honeybees are shipped to you in a small wooden box that we construct on our farm with our own natural resources. The sliding screen top has an enlarged opening at each end where the honeybee will crawl out when you’re ready, making it easy to grab one bee at a time with your tweezers. Each box contains approximately sixty honeybees. 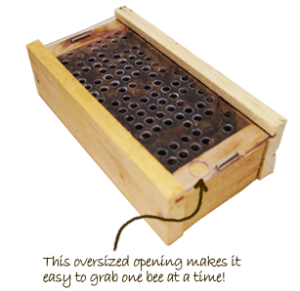 Carefully crafted over many years, our honeybees are docile and easy to use. We are proud to have provided well over 155,000 boxes to thousands of customers nationwide over the past 25 years. We offer automatic shipping for accounts secured with a credit card. When your account reaches zero, four more boxes will be charged to your credit card eliminating any lapses between shipments so you can receive your bees on time. Scheduled orders are shipped Monday or Tuesday each morning. Depending on your location, you will receive your shipment in 1-3 days. In order to receive this service, four boxes must be ordered/purchase at one time. Then Ferris Apiaries will ship as needed. 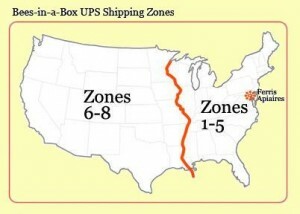 Customers living in rural areas may be subject to a UPS extended shipping charge. Single boxes are usually shipped the same day they are ordered (Monday – Wednesday) when ordered before 2 pm EST. This will ensure UPS can deliver the bees by the weekend so they will not sit in a UPS warehouse. Thursday orders must be made no later than 10:00 am EST. A Thursday order can ship 2DA; Saturday delivery. If Saturday delivery is not available in your area the bees must ship 1DA. Why does Ferris Apiaries have Summer and Winter pricing? Opening bee hives in the colder months is detrimental to the hives’ overall health and strength. In order to provide our product, extra care and expense is necessary to provide a year-round service to our customers. Our honeybees let UPS do the flying. Ferris Apiaries ships exclusively with UPS. Unfortunately, we cannot ship honeybees to all points in the continental United States via any other carrier. We have learned through extensive experience that the U.S. Postal Service is unable to consistently deliver our product alive and on time. The only reason we ask for your email address is so UPS can notify you when your shipment has left our farm. We do not share any customer information with anyone and do not send out spam. If you have placed an order with us and did not receive an email from UPS the day it is supposed to be shipped, please do not hesitate to contact us. Shipping can be very stressful for the bees. We have no control over their environment once they leave here, but there are things that you can do on your end to reduce this stress. Click here to see how UPS can help. What forms of payment does Ferris Apiaries accept? We also accept checks and money orders, however, these must be received prior to shipping your order. A $25 Returned Check Fee will be charged for all returned checks.